COUNTRY LIFE!! Yep you heard me right! 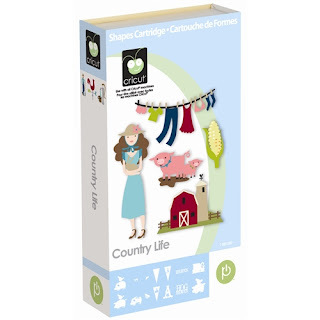 She is giving away a brand new Country Life cartridge! I had the priviledge of being on a design team with Cindy and she is an absolute talent! *okie feels pangs of jealousy in her stomach over some of the projects Cindy has made* To be eligible to win the cartridge all you have to do is go to her blog at ROYAL THINGS and look for the post titled "My CHA experience, My newest Design Team, My Giveaway" and leave a comment. And while you are there why not become a follower and check out her projects. the deadline to enter is Sunday, August 14th midnight EST. Now remember I am not giving away the cart *okie likes her Country Life cartridge too much to give it away* so comments left here do not count! Although if you do comment you won't get lashes with a wet noodle or anything. Thanks for the tip Okie! Do you have a file for making a folder to store EF's? I read it somewhere but I think it is for DS and I don't have that but I have a Gypsy. I could do it if I knew the cartridge and the size. Hi Okie, your Diva Va Voom cards are toooo cute! What in the world do you do with all those sets of cards? I mean at the rate you crank these out one would think you work for hallmark. Linda I am not sure what EF's are. I think you can convert any DS file to a Gypsy file by opening the file in DS, changing the name and saving as a Gypsy file. At least that is what I have been told. Nicole I am putting them in a box for right now! LOL Several sets will be used as prizes at my Annual Girlfriend Christmas party in December. Thanks for letting us know about the giveaway. I'm heading there next. Love those Diva cards! How do I get invited to the Girlfriend Christmas party? ; ) I have friends in Oklahoma I could stay with. Love those cards! Thanks for heads up on the Country Life give away. Glad you got your paperwork caught up! Thank you for taking the time to post the post!!!! Although getting lashes with a wet noodle sounds pretty fun! You are such a riot!!!!! Love your work and really love all of your comments that always make me smile - THANKS!!!! !